We depart from Mytilene at 10:00 in the morning and we get on a 4X4 Jeep. 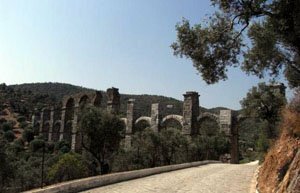 Our first destination is the Roman aqueduct in Moria which dates back to the second century, with a length of 170 metres and a height of 25 metres. The next destination is the mountainous site of Prophet Ilias at the region of gulf of Gera. 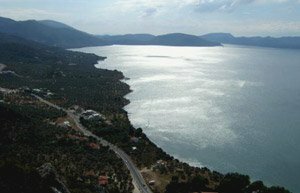 It is a place with a majestic view to the gulf as well as to the coast of Mikra Asia. Later, we will make a stop to the Museum Olive oil industry “Vranas”. It is one of the first factories in Lesvos and in the Aegean Sea, which worked with steam. It was built in 1887 by Nikolaos Vranas (the grandfather of Odysseas Elytis) in Papados, which is one of the most important villages in Lesvos and an economical centre of Gera, a region which has a long tradition in olive oil production. After a distance of 20 kilometres, we will arrive in Mesagros. The local turkish hamam dates back to 1898. The hamam was built by turkish workers for private use by the family who lived in the stately house. Later, we will visit the settlement Karionas, which is situated on the foothills of the Olympos mountain. We will travel 10 kilometres of earthy drive through the popular forest full of nut trees and we will end up to the traditional village Agiasos. It is quite a big village at an altitude of 460 metres which is famous for its paved alleys, pottery and woodcurving. In Agiasos the church of “Holy Mairi”, is located, who celebrates the 15th of August. A huge celebration takes place, while all the inhabitants of the island come in Agiasos that day, even by walking all the distance towards the village on foot. The monastery was built so as to accommodate the icon which was transferred by the monk Agathonas from Jerusalem. We make a stop for lunch at the small taverns of the village where people cook traditional meat snacks. 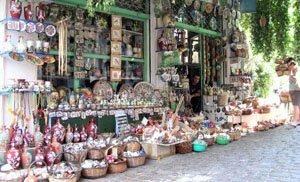 We also make a stop so as to taste the traditional greek coffee at thraka (known as hovoli in greek) and the delicious local sweets. 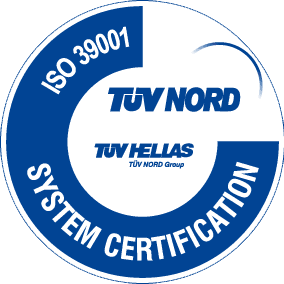 Return in Mytilene and end of the excursion. Arrival time 19:00. The excursion includes: Jeep 4X4 with fuel included in the price and a professional driver, who provides the information of the excursion in English. Price: 45€ per person. The excursion takes place only if the seats are filled.